Go! Go! Morphing! is the third secret level in Yoshi's Island: Super Mario Advance 3. The level starts with Yoshi on a small wooden platform above water in the middle of the jungle. After crossing a bridge he encounters a Piranha Plant, beyond which, Yoshi has to swim through water. After traversing another small area, Yoshi enters the water again to reach some steep descending steps and the Middle Ring thereafter. The next area is an underwater maze of rocks, which requires Yoshi to turn into a Submarine. At the end of the labyrinth is the Yoshi Block that returns Yoshi to his normal state so that he can go through another Middle Ring. Passing through a door, Yoshi comes to an area with another maze. This time, the transformed Train navigates the tracks to find the Yoshi Block, the next Middle Ring and the door to the next area. There, the player uses a Mole Tank to get to a Helicopter, which follows a path of coins to get to the next Morph Bubble. Now a Mole Tank again, Yoshi traverses the last stretch of the area, turns back to a regular Yoshi, saves with a Middle Ring and moves on to the final task. 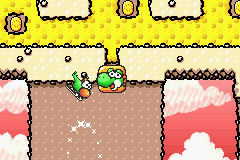 As a Car, the player navigates some moving platforms and goes through a small tunnel that leads to the last Yoshi Block and the end of the level. Spanish ¡Metamorfosis a tutiplén! Metamorphosis galore! French Les Métamorphoses. The Metamorphoses. Italian Trasformazioni a go-go! Transformations a gogo! Biàn! Biàn! Biàn! Morph! Morph! Morph! This page was last edited on February 25, 2019, at 22:46.